Back in November you may remember a post where I mentioned my husband and I had to drive four hours to Milwaukee to attend a funeral. My husband's best friend since high school father had passed away. My friend and his family are believers so I made this inspirational sympathy card for them. I want the card to really focus on being inspirational. Even though all deaths are tragic because we will miss our loved ones here on earth, we also know as believers "that to be absent from the body is to be present with Christ". So to reflect that happy thought I chose bright happy colors and papers. I also chose to use a cross image with a sun's rays behind it to represent the new life that awaits believers in heaven. 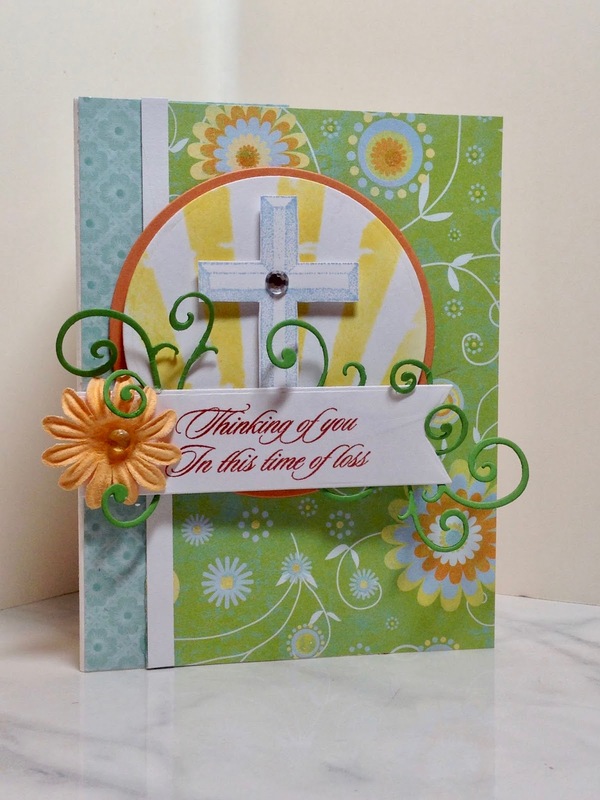 I created the sun rays using a Tim Holtz stencil and yellow ink. The cross image came from a old Stampin' Up! set called "Symbols of Salvation". 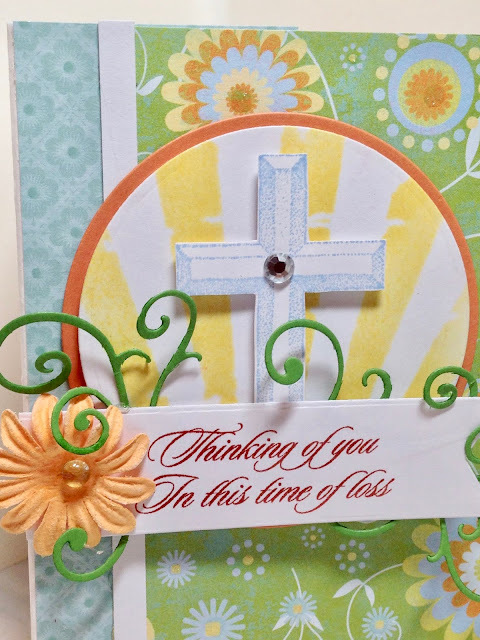 I stamped the cross in blue ink, cut it out, then mounted it up on dimensionals over the sun rays. 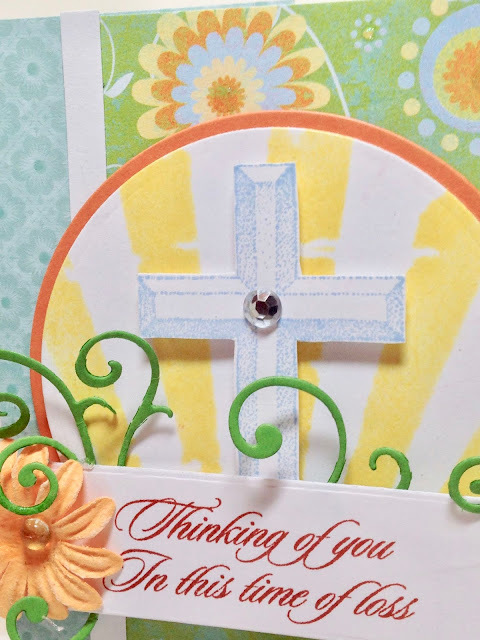 I put a crystal in the center of the cross. 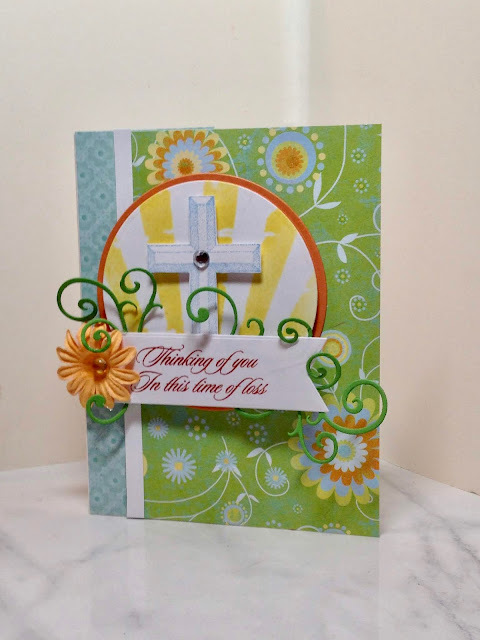 I stamped a sentiment on a MFT banner die cut. The scrolls were also cut with an MFT die. The sentiment is popped up too so I could glue the green scrolls behind it. A Prima flower with a gem glued inside finished the adornment of the card. I used circle dies from Spellbinders to cut out the sun rays and an orange border. Two different sheets of designer paper were used in the background of the card. I added a strip of white card stock to separate them. Such a sweet + thoughtful card! It's so beautiful Amy and I am sure it was so much appreciated. I love how it's so inspirational and full of hope during that sad time. Oh, thank you Ellie! You are so sweet! 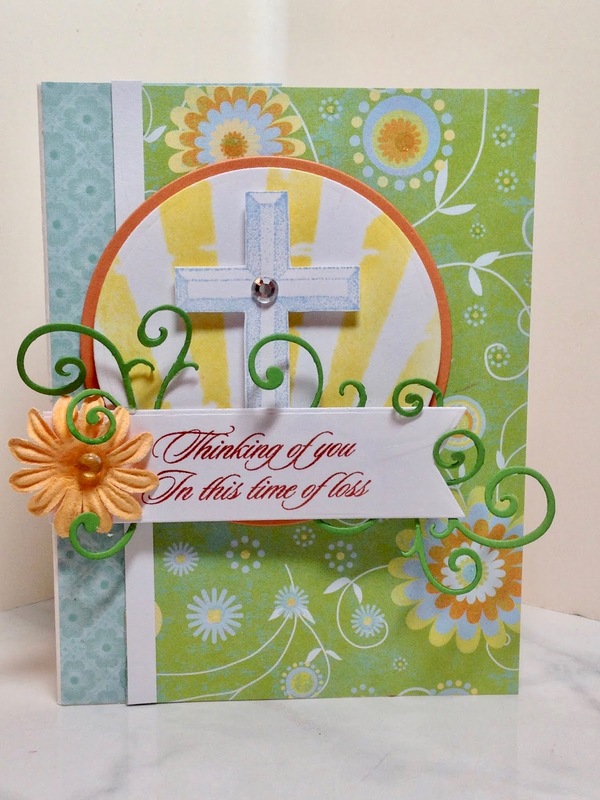 What a beautiful card - and through such a tough time, I'm sure the recipient will appreciate the work it took to make it! Thanks for sharing on Sweet Inspiration!